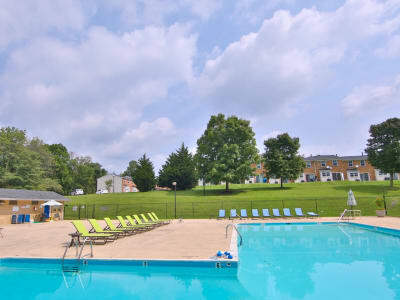 The Glens at Diamond Ridge townhome-style apartments in Baltimore, MD, are nestled in a charming community setting with mature trees, ample parking, and a host of everyday amenities. Enjoy a relaxing day soaking up the rays on the poolside sundeck, then take a refreshing dip in the swimming pool for at-home luxury you’ll love. Take your dog for a walk through the peaceful neighborhood or let them get their energy out in our large community dog park. Inside your home, you’ll find the spaces and features you’re looking for, including ample closets and cabinets, plush carpeting, and an extra half bath for guests and everyday use. Get more from your home and your community with a modern Baltimore townhome apartment at The Glens at Diamond Ridge. Call today for a personal tour.